Perjury consists of making a false statement under oath in an official proceeding. The New Jersey Code of Criminal Justice deals with NJ perjury in N.J.S. 2C:28-1. The United States Code deals with federal perjury charges in Title 18, Chapter 79. The two federal provisions of especial relevance are 18 U.S.C. 1621, and 18 U.S.C. 1623. On this page, we examine both New Jersey perjury and federal perjury. We look more closely at what constitutes perjury, and some nuances of perjury law. We also look at “false swearing,” a New Jersey crime related to perjury. As indicated above, under the New Jersey Code of Criminal Justice, perjury consists of making a false statement in an official proceeding. The statement must be made under oath. Beyond being false, the person making the statement must actually believe that it is false. Merely being mistaken does not rise to the level of perjury. Another requirement before a false statement can constitute perjury under New Jersey Law is that the statement must be material. “Material” means that the statement can affect the course or outcome of the proceeding. Thus if a witness to a car accident testifies in court that she was born in California when, in fact, she was born in Ohio, her statement is unlikely to constitute perjury, as the issues in that accident case probably do not concern where the witness was born. It would not constitue perjury even though the witness knows she was born in Ohio. A separate New Jersey criminal offense akin to perjury is “false swearing.” The New Jersey code of Criminal Justice deals with false swearing at N.J.S. 2C:28-2. False swearing, like perjury, requires a false statement under oath. The difference between perjury and false swearing is that perjury requires that the false statement be made in an “official proceeding.” No such requirement exists for false swearing. Thus for example, attesting to a known falsehood in a notarized document constitutes false swearing. As mentioned above, for a false statement to constitute perjury, the false statement must be material. No such requirement exists for false swearing. If the sworn statement is knowingly false, it constitutes false swearing regardless of whether it is material. Interestingly, to constitute false swearing, the statement need not be false. False swearing can occur when the statement is actually true, but the maker of the statement believes that it is false! Perjury under New Jersey law is a third degree crime. False swearing is a fourth degree crime. New Jersey provides a limited opportunity for “cure.” That is, the person who committed perjury can “'fess up” and thereby avoid conviction. However, the individual must retract the falsity before the matter in which the perjury occurred concludes. Further, the retraction is effective only if no party to the proceeding suffered irreparable harm. As with perjury, false swearing can also be “retracted.” To be effective, the retraction must be made before the conclusion of the proceeding under which the false statement is made. Under current New Jersey law, convictions for both perjury and false swearing can never be expunged, regardless of how much time has passed following the conviction. 18 U.S.C. 1623 is very similar to 18 U.S.C. 1621. Its major difference is that where 18 U.S.C. 1621 perjury can occur in any of a multitude of forums, 18 U.S.C. 1623 is limited to false declarations under oath before a court or grand jury of the United States. Under 18 U.S.C. 1623, false statements can be “cured” (similar to the cure provisions concerning perjury under the New Jersey Code of Criminal Justice). 18 U.S.C. 1621 does not contain any provision for cure. For violations of both 18 U.S.C. 1621 and 18 U.S.C. 1623, imprisonment upon conviction can be for up to five years. 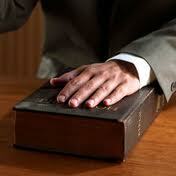 Criminal Lawyers in New Jersey have successfully represented persons charged with perjury. They understand perjury law, both New Jersey and federal. And they know their way around the courtroom. Persons charged with, or who may be charged with, perjury, should call them for a no-cost no-obligation initial conference. They should speak with a knowledgeable, experienced New Jersey criminal defense lawyer before discussing the matter with any other person. Page last updated 20 August 2017, and displayed Thursday 18 April 2019, at 06:18:56 EDT.